This festive (but closed for its original purpose) amusement park building evokes laughing children and a herd of moving wooden horses. The B&W rendition suggests its history, and the position of the sun provides a halo! 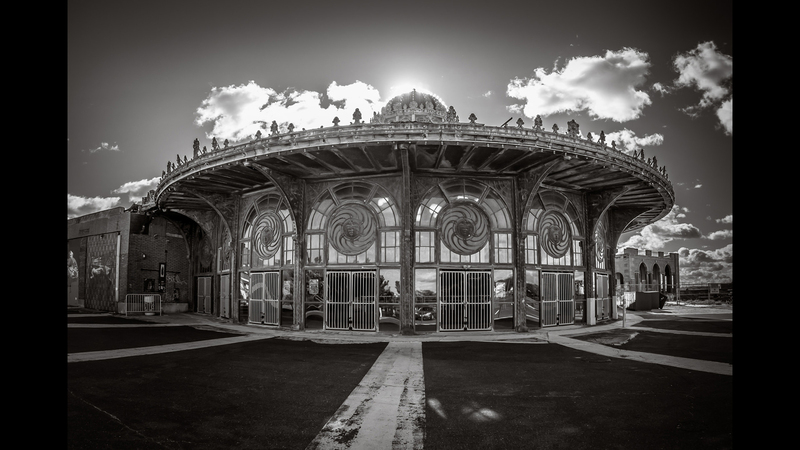 Interestingly, the building originally housed the Philadelphia Toboggan Company Carousel #87, installed in the ornate Carousel House in 1932 and would run for more than half a century. The actual carousel was purchased in 1990 and moved to Family Kingdom Park in Myrtle Beach, S.C., where it now operates with fiberglass replicas of the original wooden horses. Today the building is used mostly as a theater and music venue, as well as a haven for skateboarders. By the way, there is an entire magazine devoted to theme park architecture! Posted in ART, CONSTRUCTION, ENVIRONMENT, ONLINE ONLY, PARKS, tagged amusement park, Bruno Ferrin, community, Great Big Story, Italy, kinetic, Osteria ai Pioppi, play, poplar grove, rides, sculpture on June 30, 2016| 1 Comment ” Osteria ai Pioppi is an unusual ecological amusement park in a small community north of Venice, Italy. Thank you for picking my photo! I knew some of that history but not all of it.